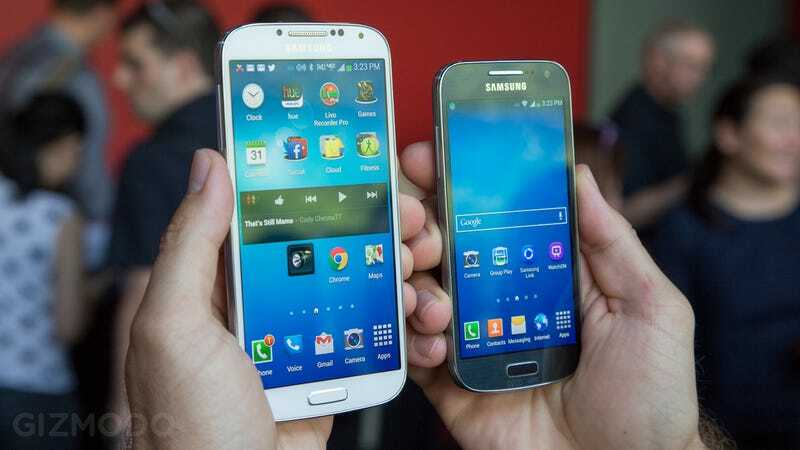 It's no secret that a smaller version of the Galaxy S4, known as the Galaxy S4 Mini, is on its way. Nor is it hush-hush that a camera/phone hybrid known as the Galaxy S4 Zoom is coming. While there's still no information about when these will make these over to the States, we just got a little play time with them. Here are our first impressions. The Galaxy Zoom is definitely the more interesting of the two. It feels thick and rather bulgy in your pocket, certainly by today's standards, though it's not much thicker than a lot of dumb phones from five years ago. Not exactly the gold standard of ergonomics, but it's not unthinkable that someone might use this as their phone. However, that someone would have to be reeeeeally into photography. The 4.3-inch qHD screen (960x540) looks, y'know, fine. It's not winning any beauty pagents, though. You wonder why, if you're putting a 16MP camera on a phone, you wouldn't put at least a real HD screen on it so you could see the detail. The camera has a ring which you can use to operate the optical 10x zoom (which looked very good), and to quickstart into a specific camera mode from anywhere in the phone. So if you're browsing the web and suddenly see something that would make a perfect animated GIF, you'd just turn the dial to select that mode, and you're good to go. It also has a dedicated shutter button (as ALL PHONES SHOULD), a micro SD card slot, and even a tripod mount. Good idea. The camera software is being revamped (it's very pre-release right now) to add even more features from the already feature-rich camera app. More modes, basically, and goodies like on-screen zoom buttons. Aside from that, the software is pretty much the same as it is on the normal Galaxy S4, as in it runs Android 4.2.2 with Samsung's heavy TouchWiz skin on top. Unfortunately, the Zoom doesn't have the horsepower of the real S4. That manifested in apps being slow to open, and there being noticeable delay when navigating the UI. It may get better before release, but don't expect a speedster. There's not reeeally a whole lot to say about the Galaxy S4 Mini. It is, as you'd imagine, smaller than the Galaxy S4. It's also slower, has a lower res screen, and a worse camera. Essentially, the Galaxy S4 Zoom, without the the big camera on the back. 4.3-inch qHD screen, dual-core 1.7 GHz processor, 1GB of RAM. On the positive side, it's very comfortable to hold. 4.3-inches actually feels small nowadays in the Android world. People with very small hands will probably be psyched. People with larger hands won't have to stretch to reach the far side of the screen at all. The other (probably) good news, is that it will probably be cheaper than the S4. And by that we mean it had better be a lot cheaper, because it really is a mid-range phone by today's standards. Why it bears the S4 name at all is kind of... well, questionable. There's nothing wrong with the S4 Mini, there's just nothing remarkable able it. At all. In any way. It would have been a good phone in 2012. In 2013 it's a snoozer.